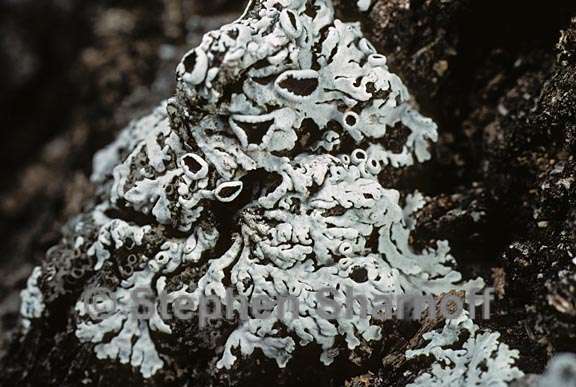 Thallus: foliose, irregular to orbicular, to 5 cm or up to 10 cm when confluent with other thalli, firmly adnate with distinct lobes and patchily pigmented medulla, dichotomously to subpalmately lobate lobes: linear, elongate, usually overlapping, sometimes discrete, flat, ± sinuose, 1-2 mm broard, usually with peculiar knobs along margins, eciliate upper surface: grayish white, gray to dark gray, often rugulose, usually with a distinct white pruina; soredia and isidia absent upper cortex: prosoplectenchymatous medulla: white, mostly but not always with patches of yellow to yellow-brown pigment (K+ purple) lower cortex: prosoplectenchymatous lower surface: pinkish to pale brown or brown, rhizinate; rhizines: scattered, pale to dark, simple Apothecia: ± common, up to 6 mm diam., substipitate, but usually smaller, often with a rough pruina; margins: white pruinose, sometimes lobulate; disc: blackish brown, epruinose asci: subclavate to clavate, 8-spored ascospores: brown, l-septate, ellipsoid, Pachysporaria-type, (19.5-) 21-26 (-29) x (9.5-) 10.5-12 (-13) µm Pycnidia: ± common, visible as black dots and often concentrated to lobe margins conidia: bacilliform, 4-5 x 1 µm Spot tests: cortex K+ yellow C-, KC-, P+ yellow; medulla K+ purple (where pigmented), C-, KC-, P- Secondary metabolites: cortex with atranorin and chloroatranorin; medulla with atranorin, zeorin, leucotylin and an unknown yellow to brownish pigment (K+ purple). Substrate and ecology: growing on trunks, twigs and rocks and seems to prefer open, but humid conditions World distribution: SW USA and extensively in Mexico Sonoran distribution: very common in oak and pine forests of SE Arizona and adjacent Sierra Madre Occidental region of Chihuahua and Sonora and in the mountains in the southern part of Baja California Sur. Notes: Heterodermia rugulosa is an extremely variable species with very different appearances on different substrates. On bark it is usually broad-lobed with overlapping lobes; while on twigs, short-lobed with ± fingerlike lobes and on rocks it has discrete, distinctly effigurate lobes. It may be difficult to identify if the pigment in the medulla is sparse, but the lobe primordia along lobe margins are typical for the species. This is similar to H. diademata, that has been erroneously reported from the Sonoran region. Also it is similar to H. tropica, which is probably closely related but it lacks the pigment in the medulla.